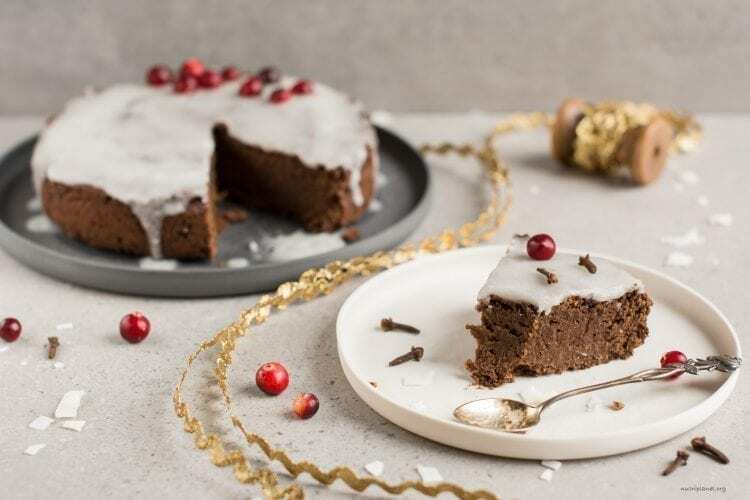 Here’s absolutely delicious gluten-free vegan gingerbread cake recipe – right on spot for the holiday season. 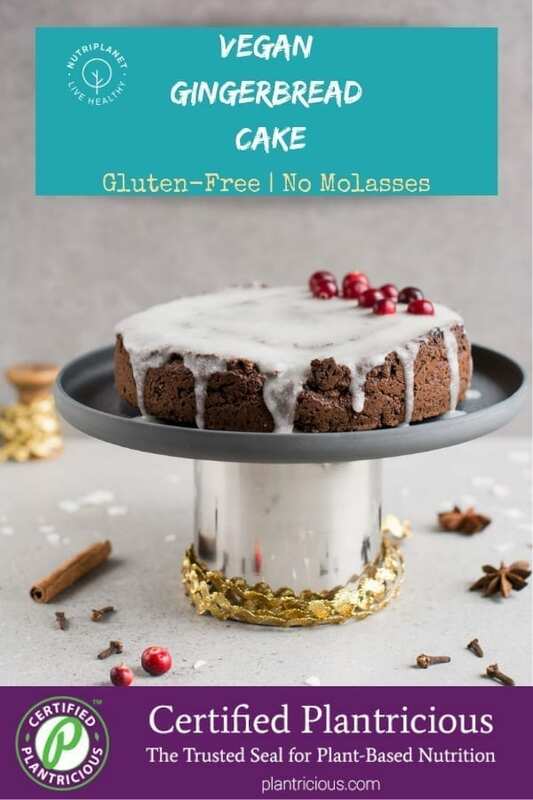 It’s an easy sugar-free no molasses gingerbread cake suitable for those on low glycemic or Candida diet. 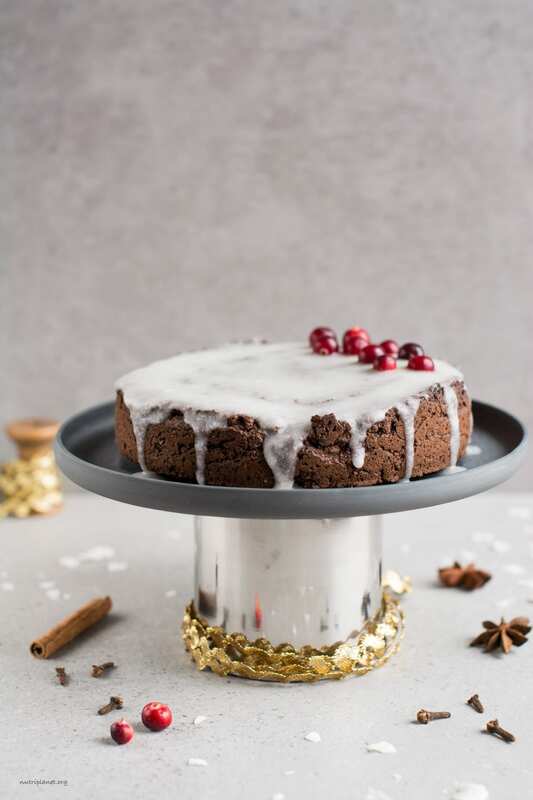 My healthy gingerbread cake recipe came about when I was looking to develop a sweet Christmas recipe other than gingerbread cookies (I already have quite many of those up on my blog). Given that I’m a big fan of vegan cakes, gingerbread cake needed to happen. 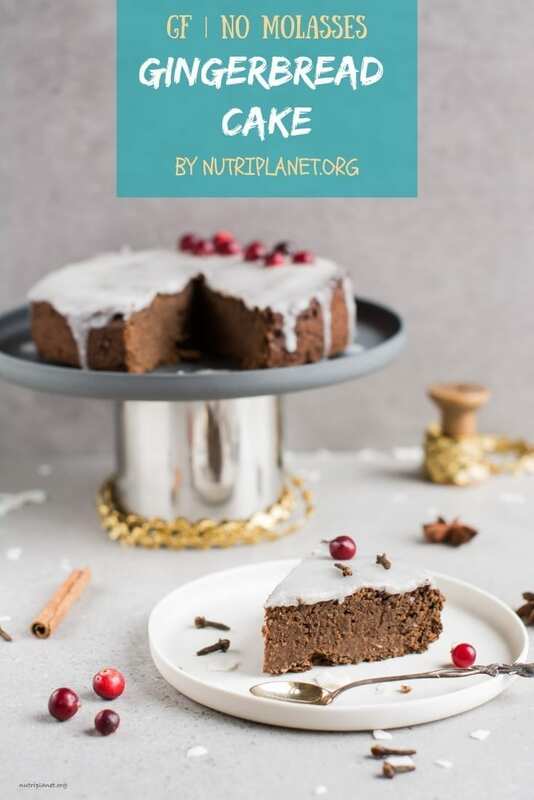 A side note – this gingerbread cake recipe makes part of 11 Vegan Holiday Recipes for Christmas Dinner that myself and 10 other vegan bloggers put together to help you choose easy vegan holiday recipes. I like to think that my gluten-free gingerbread cake has almost healing properties. Now, brood over all those anti-inflammatory, anti-fungal and anti-bacterial qualities of gingerbread spice cake and you’ll know what I mean. How to make gingerbread cake? It’s easy really – you start with gingerbread cookie recipe and leave the batter moister. However, I wanted something quite different from my previous gingerbread recipes and decided to go for a rather unconventional ingredient that you usually don’t associate with Christmas sweet treats – chickpeas! Indeed, the wet mixture of my easy gingerbread cake recipe consists of chickpeas, tahini and plant milk blended together. To give you an idea – usually it’s oil or butter and some kind of syrup and/or molasses. What do you think, which version is healthier? 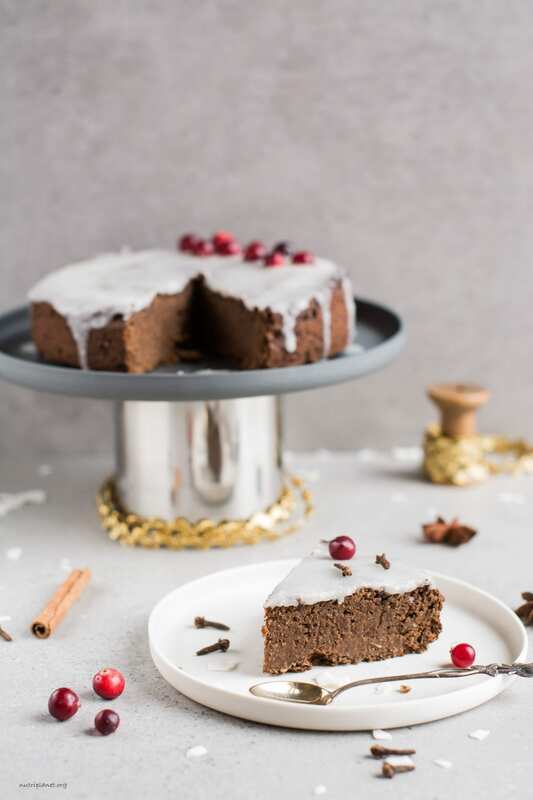 What’s so great about my vegan gluten-free gingerbread cake? It’s also oil-free and doesn’t use any refined ingredients. 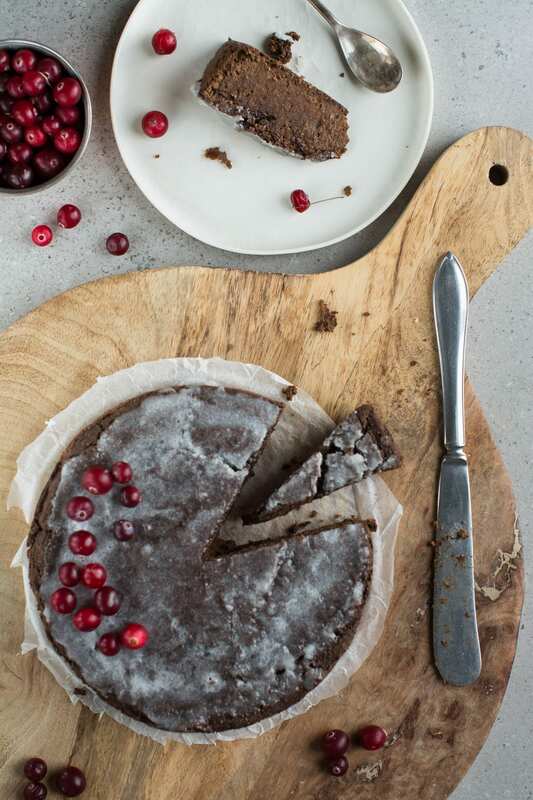 It’s a sugar-free gingerbread cake without molasses (not so common). What makes it a healthy gingerbread cake? Instead of butter or oil I use tahini and chickpeas in this recipe. Whole grain oat flour replaces refined wheat flour. High glycemic refined sugars and syrups are left on supermarket shelf and birch xylitol is being used instead. I’m using homemade gingerbread spice mix made of organic spices. High-fibre chia seeds rich in omega-3s replace eggs. First, make the wet mixture: rinse and drain chickpeas well and blend them with tahini, almond milk and xylitol into homogeneous batter. Set aside. Then, in a large bowl, mix together all the dry ingredients and pour the wet mixture over. Mix with spatula until you have homogeneous batter. Let it sit for 10 minutes (it’ll thicken as the chia seeds absorb liquid). Next, line the bottom of a cake pan with parchment paper and grease the sides with coconut oil or avocado oil. Preheat the oven to 175°C (350°F) and bake the gingerbread cake for 45-50 minutes. It’s ready when toothpick inserted into the cake comes out almost clean. The smaller the cake pan, the longer it’ll take. I used 15cm (5.9inch) round cake tin and baked it for 50 minutes on the lower rack (my cake was 2.5cm, 1inch thick). You may also use loaf pan for gingerbread loaf. Let the cake cool before slicing and/or frosting. Nutritional info using 4 tbsps. of xylitol and 3 tbsps. of oat flour (⅛ of cake without frosting): 169 kcal, 13.8g carbohydrates (49.9% of kcal), 7.87g fats (41.8% of kcal), 7.4g protein (17.5% of kcal), 6.92g fibre, 127mg sodium, and 6.2 GL points. Nutritional info using 4 tbsps. of date sugar and 3 tbsps. of oat flour (⅛ of cake without frosting): 174 kcal, 14.6g carbohydrates (50.5% of kcal), 7.95g fats (41.2% of kcal), 7.47g protein (17.2% of kcal), 6.85g fibre, and 79.4mg sodium. Frost this vegan gingerbread cake with Cream Cheese Frosting or Vegan Royal Icing. My royal icing does not use powdered sugar, but powdered xylitol making it suitable for those on Candida diet or on low glycemic diet. This vegan gingerbread cake is not overly sweet by itself, but is just perfect when frosted with Royal icing. In case you ditch the frosting, feel free to add a more sweetener (5 tablespoons). My gingerbread cake is quite moist. Should you prefer drier version, use 4 tablespoons of oat flour. On the other hand, I suggest using 3 tablespoons of flour, if you know that the cake is going to last for several days. You might need to add a bit more plan milk (about a few tablespoons), if you use home-cooked chickpeas. It’s because in my experience, canned chickpeas tend to be a lot moister than home-cooked ones. Instead of tahini, you may use any other additive-free nut or seed butter. Almond milk can be substituted with any other additive-free plant milk: oat milk, rice milk, cashew milk, hemp milk, or soy milk etc. Should you use naturally sweet plant milk (oat and rice), add about 1 tablespoon LESS of xylitol. Feel free to use liquid stevia instead of xylitol: 1 tablespoon of xylitol equals about 12 drops of stevia. 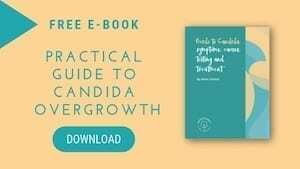 Should you not struggle with Candida overgrowth or unstable blood sugar, feel free to use any preferred sweetener, i.e. brown sugar (raw cane sugar), coconut sugar, maple syrup, blackstrap molasses, or agave syrup. You can use any nut flour instead of almond flour – coconut flour, peanut flour, pumpkin seed flour etc. Make sure the flours (protein powders) are additive-free. Especially watch out for added sugars. Next, you can use other gluten-free flours instead of oat flour, e.g. teff flour, buckwheat flour or rice flour. I wouldn’t recommend using 100% rice flour though as it has quite strong taste. I can affirm that the cake is delicious with teff flour. If you’re allergic to baking powder, leave it out. The result may be a bit denser, but not much as the batter is quite thick anyway.